We Can Help Your Child Learn To Play The Piano! Is it difficult to learn the piano? Most people would say “Yes” to that question. I don’t think it has to be. I think learning piano can actually be quite simple, but only if you take the right approach. The traditional way that piano is taught is that the teacher demonstrates the basics and then students are expected to take their music home to study and learn. There’s nothing necessarily wrong this approach. In fact, I was taught this way and most parents of my piano students were taught this way when they took lessons as kids. However, there is an easier way to learn. I don’t put my students in an adversarial position to me. 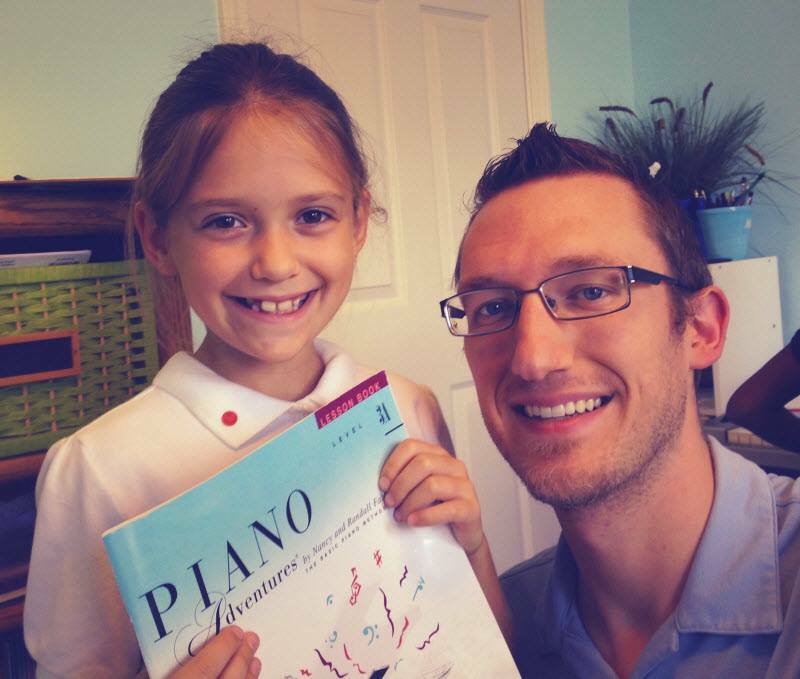 It truly is a partnership, in that students learn ALL of their piano music with me at the lesson. That way, when I send them home, they are practicing the way professionals practice. In other words, they are practicing with few or NO mistakes. Students are taught all of their piano music during the lesson. By taking this approach, they accelerate through their beginning books faster (typically 2x or even 3x faster). This approach is, in the end, a benefit to the student. In essence, students see and understand that they are GOOD which in turn increases their confidence immensely! When a student’s confidence increases, he or she doesn’t view playing the piano as just more homework, rather it becomes an enjoyable activity. In the end, it’s a self-propelling cycle and it’s truly amazing to see kids excel at learning piano. And yet, most teachers do not teach in this fashion, which is why most piano students drop out after a year. Students drop out when they are expected to succeed, but don’t have the necessary emotional or musical skills to do so. They become that stereotypical music student; they struggle for years and sound bad most of the time. That doesn’t happen here. My students are sight reading notes and rhythm with 100% accuracy within one month which is no exaggeration. I truly believe that all children have the ability to learn how to play piano and make good music. My approach is different in that I tap into that natural creativity and expression to bring out the best possible result.